There was a time, about 6 or 8 months ago, when I had finished the rough draft of my first (well, technically second, but who’s counting?) novella, and I didn’t know what to do next. I had revised it a few times right off the bat, but I knew I couldn’t just keep reading it over and over without a break. What I wanted to do was kick up my feet and smoke a big, fat cigar (figuratively speaking), and revel in my accomplishment. But deep down I knew that wasn’t the right thing to do. A little voice in my head whispered, Write another one. Over time, the voice grew from a whisper to a yell. What the hell are you doing?!? You know how you are, if you stop now, you’ll never start back up! And that voice was right. So I started another. And finished it. Then I hesitated again, unsure if the editing process alone would make me want to keep writing. What I realized is the only thing that would keep me writing was to keep writing. So I started on my first novel. Now that I’ve been writing nonstop (not counting one liver-punishing vacation to Las Vegas) for just over a year, I feel like I’m starting to get it. With some rare exceptions, you really don’t ever stop writing. One story leads to the next. Another brick in the wall, so to speak. But I still have my doubts, and there’s this other voice in my head that says things like, You’ve written again, you’ve proven to yourself you can do it. You don’t REALLY have to keep going if you don’t want to. But I’m doing my best to tell that voice to sit on it (Happy Days reference! ), and just ignore it. In the short time since I started this blog I’ve found a lot of very helpful and inspiring bloggers out there who are in a very similar situation to my own. It really is nice to know I’m not alone in this. Then, today I found a little something that helped as well. To keep it criminally short, it was a project that involved asking some famous authors to put some advice to writers on their hand. 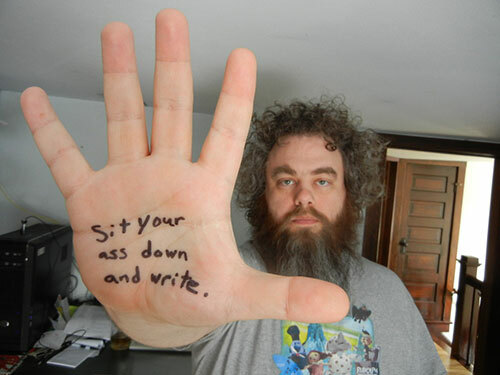 One of my favorites is from Patrick Rothfuss (the pic at the top of the post), but they are all really nice bits of inspiration. I highly recommend anyone curious check it out. Now, I realize I’m one of the last people who should be giving out advice to anyone, but once I realized there were other writers out there as green as me, I figured there was a chance someone might be looking for something to keep them going. This is that. P.S. – Yes, I realize this post is parenthesis happy. This entry was posted in Writing and tagged A-Z Challenge, Writing. Bookmark the permalink.